In addition to the Round, Oval and Freeform, Radiant Pools also offers a classic Grecian shaped pool for semi-inground installation. 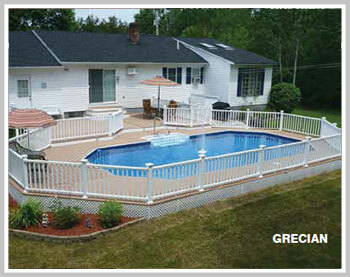 At least 50% of the Radiant Metric Grecian Pool wall (26”) must be installed below the ground. 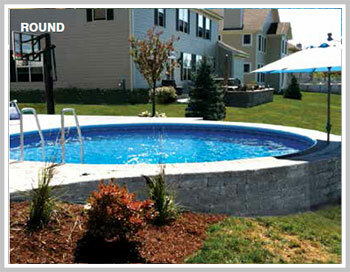 This pool gives you more options on installation and finishing! You can add a full deck to this amazing pool using 5/4 wood receptor coping. 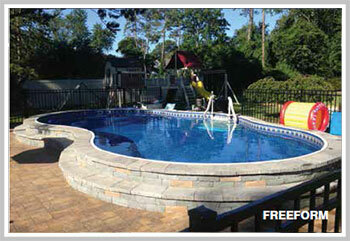 With this option, you get a clean finished edge, creating a smooth transition from deck to pool. Add a walk-in step or paver surround, and you can enjoy the look and feel of an inground pool for a fraction of the price. 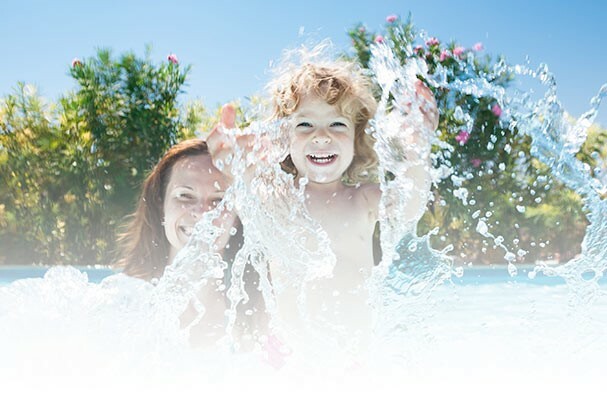 Whatever your vision, Radiant Metric Semi-Inground Pools have varied shapes, sizes and installation options that allow it to comply with the requirements and restrictions of many homeowners associations regarding swimming pools. Now you can have the backyard you want in the neighborhood you choose! When it comes to innovative engineering and superior structural integrity, it’s what you don’t see that counts! Engineered from technology developed for the NASA space program, Radiant Pools are the only structurally insulated swimming pools manufactured using an R-10 structural insulated panel – an industry first. Our 2-inch thick wall panels are constructed of an EPS (expanded polystyrene) foam insulation core bonded between sheets of durable acrylic coated aluminum. The patented bonding process that joins the three layers creates a rigid wall that is far stronger and more durable than any other pool wall. Tested and proven for over 50 years! Today, residential lots offer many landscape challenges. 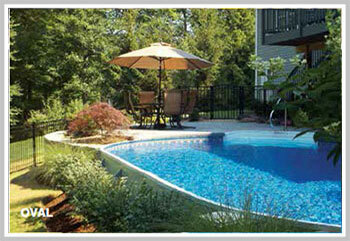 With the superior wall construction of the Radiant Pool, you now have options! Radiant Metric Series Pools can be installed aboveground, inground, and semi-inground, on a slope or into a hill and no retaining wall required! The Radiant Metric Series Pool fits any backyard, any budget, anywhere. No other pool offers you this type of versatility! Radiant Pools’ R-10 insulated wall panels resist heat loss more efficiently than any other type of pool wall, maintaining water temperatures 5-10 degrees warmer. Radiant insulated wall panels help keep the water warmer longer so you can extend the swimming season by up to 2 months and save $1000’s on heating costs. Ask your dealer for all the Energy Savings details!